Apart from gag comics, the non-Disneyic material in Britain's Mickey Mouse Magazine also included serious adventure comics. These consisted, on one had, of reprints of American Sunday newspaper comics in the color central pages, and, on the other, black&white comics by mostly British artists. Pioneer British newspaper comics artist Hugh Stanley White (1904-84) was responsible for most of the latter material in the early issues. 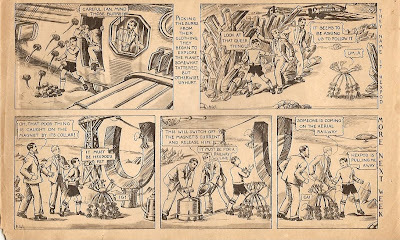 The first issue of MMW, dated Feb. 8th, 1936, featured two comics by White: the full-page 'Ian on Mu' and the three-row 'Ginger Nick the Whaler'. 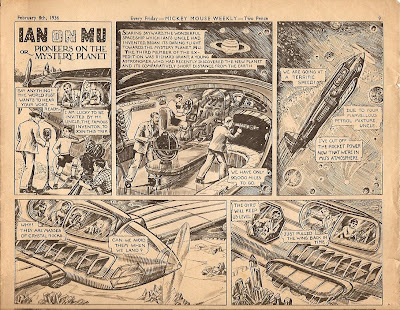 'Ian on Mu' is referred to as Britain's first science-fiction comics by online comics encyclopedia Lambiek. As can be seen in the above scan from its first installement at no.1, it tells the story of an expedition to a mysterious planet. Nevertheless, apart from the appearance of some robots, full-fledged sci-fi elements do not really bloom in its 15-issues run. The expedion discovers a Chinese (!) colony on this planet and sets out to rescue its imprisoned princess from rouge elements. 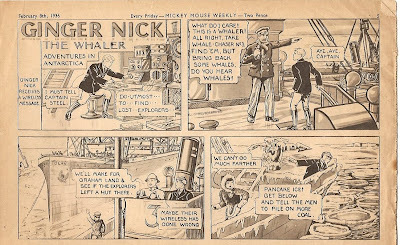 'Ginger Nick the Whaler', on the other hand, is more mundane and lasted for only 11 issues. Green Eyes 53-60 1937 ? The Lost Colony of Atlantis 73-87 1937 ? Conquest of the Gulf Stream 148-165 1938-39 ? Perhaps I can help identify some of the early artists who worked for MMW. The late Denis Gifford gave some details about the strips and their first artists in his book 'The British comic catalogue, 1874-1974'. His lists are not exhaustive, and sometimes not as reliable as might be expected. The biggest problem however is that he gives only the first and original artist for each strip. When strips were taken over by other hands, he does not give the names of the successor(s). If you are interested, I can scan the relevant pages and send them to you (pdf or jpeg), but then I will need your e-mail address.